Excellent For: Performance/agility dogs, working/service dogs, field/hunting dogs, all dogs from puppies to seniors. OK for cats too! Will Sea "Mobility" Help? Studies show that by using our combined powerful ingredients you can increase your dog's flexibility, mobility, range of motion and make it way more fun to enjoy life! Ark Natural products are formulated and recommended by Dr. Nancy Scanlan DVM and Dr. C. Leigh Broadhurst PhD. All Ark Naturals products are natural, made in the USA in USDA/APHIS registered facilities and are GMP (good manufacturing practices) compliant. Our ingredients are sourced from human facilities. Proud members of the NPA, APPA and NASC. For dogs 12 weeks and older. Cats 12 weeks and older. 1 Square - Up to 15 lbs daily. 2 Squares - Up to 30 lbs daily. 3 Squares - Up to 40 lbs daily. 4 Squares - Up to 50 lbs daily. Over 50 lbs - 1 Additional square for each 15 lbs over 50. Use Continually for best results. 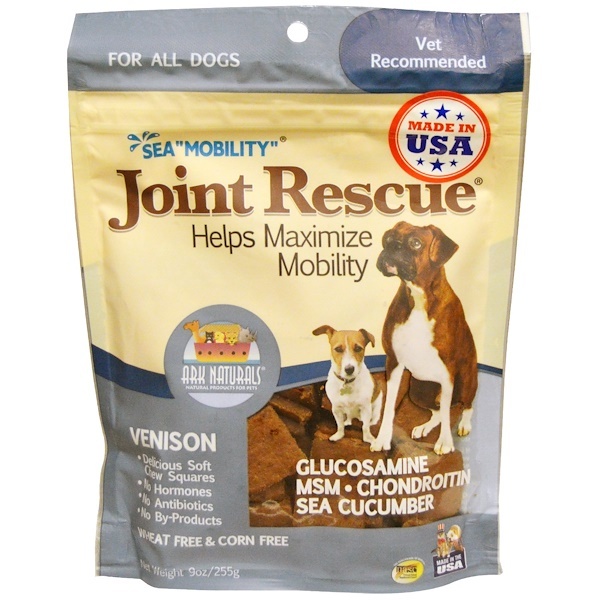 Ark's Joint Rescue squares may be combined with Joint Rescue Chewables or another product you currently use. Inactive Ingredients: Cultured whey, evening primrose oil (omega-6), fish oil (omega-3), gelatin, glycerin, maple syrup, mixed tocopherols, natural smoke flavor, rice flour, salt, tapioca starch, Venison. 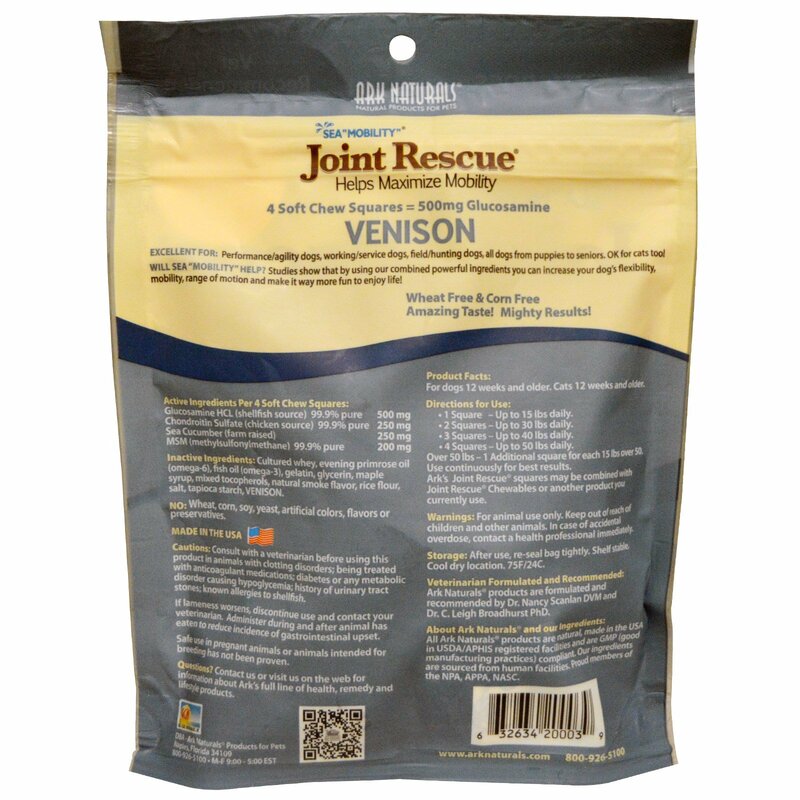 Caution: Consult with a veterinarian before using this product in animals with clotting disorders; being treated with anticoagulant medications; diabetes or any metabolic disorder causing hypoglycemia; history of urinary tract stones; known allergies to shellfish.